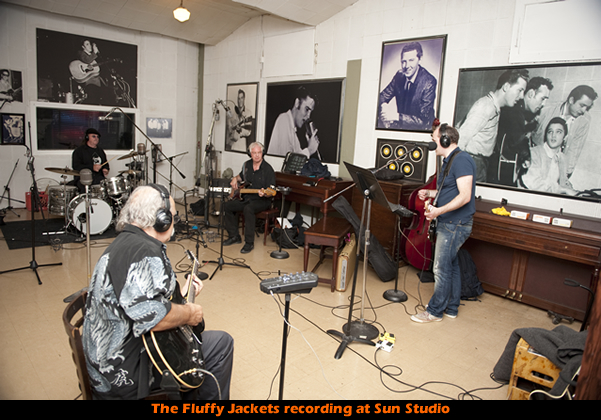 The first Fluffy Jackets recording session was held at the birthplace of rock and roll, Sun Studio in Memphis TN, on the 22nd October 2011. A memorable rehearsal took place in a private home / warehouse in Memphis TN the evening prior to the recording. 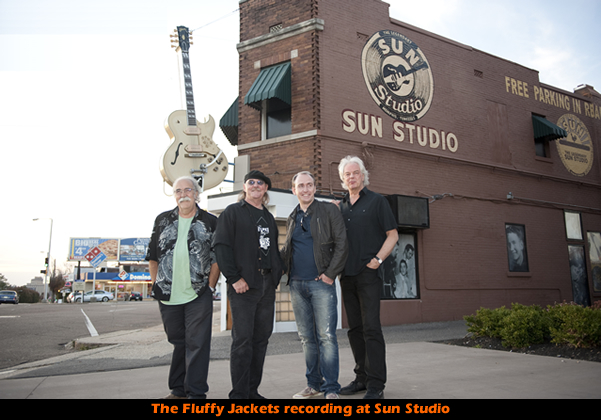 The musicians comprised of Fluffy Jackets founder Helge Rognstad along with special guests; Nazareth guitarist Manny Charlton, Whitesnake bassist Neil Murray, and drummer with Jerry Lee Lewis’s Killer Band, Robert Hall. This is the story how the recording came about, including instruments and equipment used. 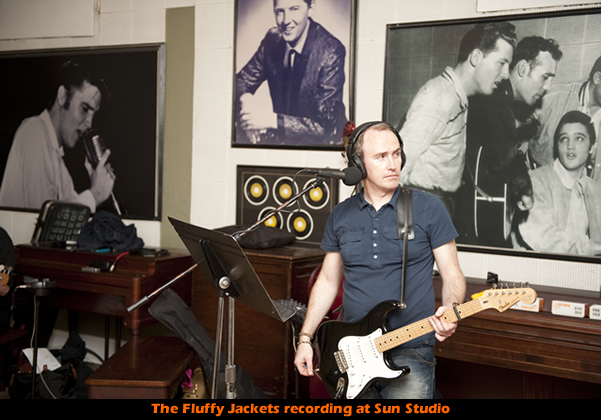 The idea to do this recording was born when I first visited Sun Studio in 2005 as a tourist. 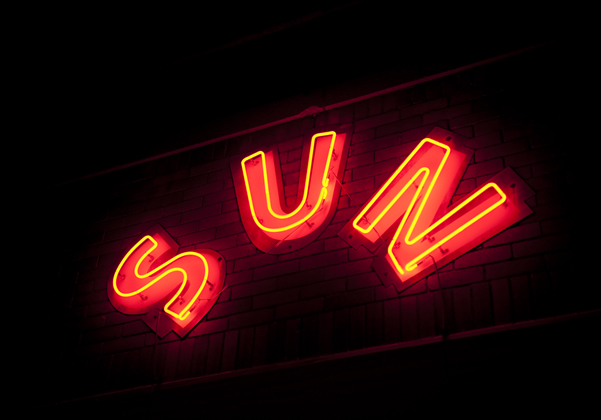 Sun Studio was a working museum, left pretty much as it was when Howling Wolf, Elvis, Carl Perkins, Roy Orbison, Jerry Lee Lewis and Johnny Cash recorded there in the 1950s. I remember that it was a very special feeling to hear Elvis’ voice came through the speakers at Sun Studio, whilst standing in the exact spot where he recorded his very first session. I looked at the picture of the “million dollar quartet” (Elvis Presley, Johnny Cash, Jerry Lee Lewis & Carl Perkins) and got the idea to try to assemble some of my own favorite players for a recording session. This little “day-dream” would eventually open some amazing experiences down the road. The first port of call was Neil Murray – the original Whitesnake bassist - who had helped us to record our first Fluffy Jackets EP back in 2007. Neil is one of the best bass players when it comes to blues-rock, if not the best. His playing is - and have always been – sublime, so I am thrilled to have his melodic bass on this album. Then, my next call was to Manny Charlton of Nazareth fame. Manny is right up there among my all time favorite guitarists. From his insane solo in Love Hurts, to the heavy riffing in Razamanaz, he has impeccable sense of tone, control and phrasing. Manny also happens to be a very knowledgeable music historian, a gifted songwriter and an awesome producer. Recording with your childhood idols does not happen often, so I was – and still am - overjoyed to hear him play on this record. 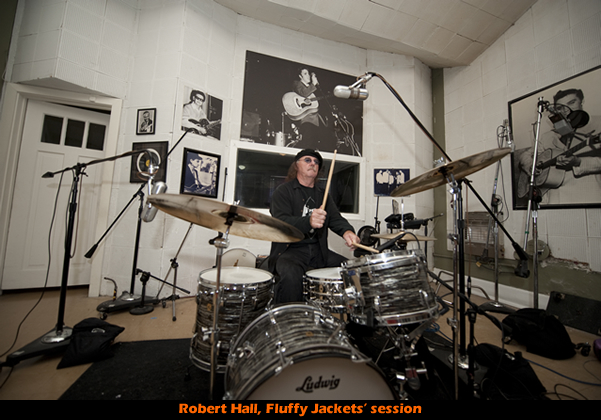 On drums, I had hoped to bring in my friend and Fluffy Jackets co-founder, Ian Robinson. But Ian had relocated to Singapore and had to turn the offer down. 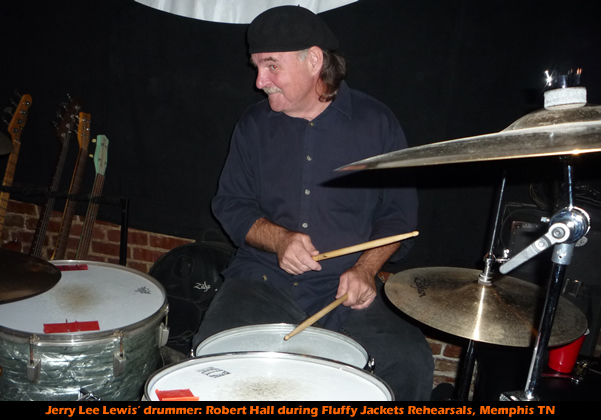 So the search for a drummer replacement began and was eventually found in Robert Hall, who is the current drummer for Jerry Lee Lewis, the only surviving member of Sun Studio’s Million Dollar Quartet. Robert Hall is a marvelous drummer, and also happens to be a lovely person. His southern hospitality would make our visit to Memphis very more memorable. Once this fantastic group was successfully assembled, it was time to prepare for the recording. After a quick conversation with the engineer/producer (and Grammy Award winner) Matt Ross Spang, the recording session was booked! Meeting Robert Hall was great, because he had so many great stories to tell about the Memphis music scene through the years. 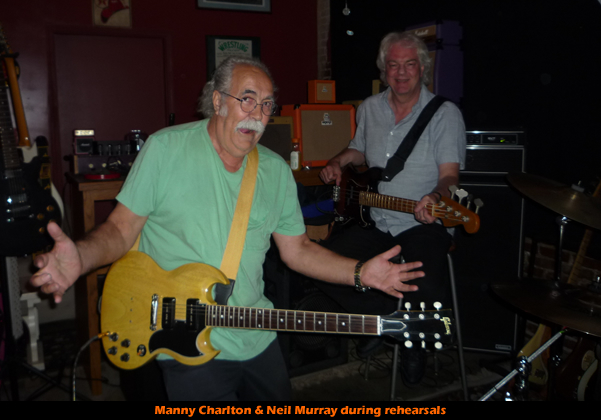 Not only that, but he also organised a fantastic rehearsal room for us, which had over 70 guitars for Manny and me to select from... As pictures show, Manny played a Gibson SG with P90 pick-ups, which sounded just sweet through the Marshall amp. We had a great night rehearsing there. 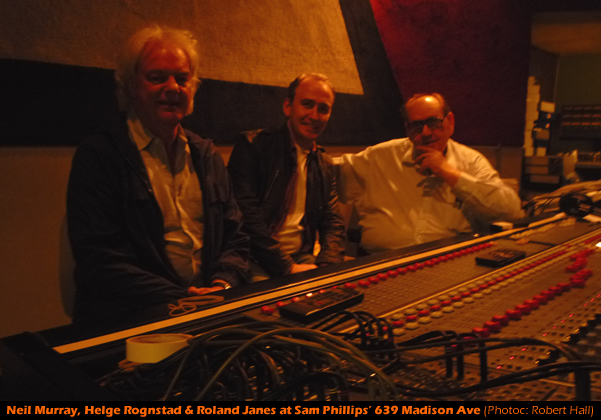 I also have to include a picture here which Robert Hall took of us hanging out with Roland Janes. Though not a household name like his peer & pal Scotty Moore, this guy is actually no less critical in defining the rockabilly guitar style of Sun Studios. He played on the now legendary sessions by Jerry Lee Lewis and Billy Lee Riley, and was the linchpin guitarist of the Sun Studio house band from 1956 to 1963. 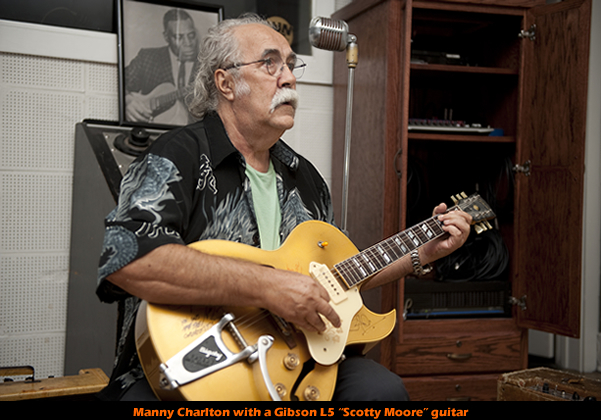 He featured on Lewis' recordings "Whole Lotta Shaking Going On", which Manny Charlton told me is one of his favorite guitar performances of all time. 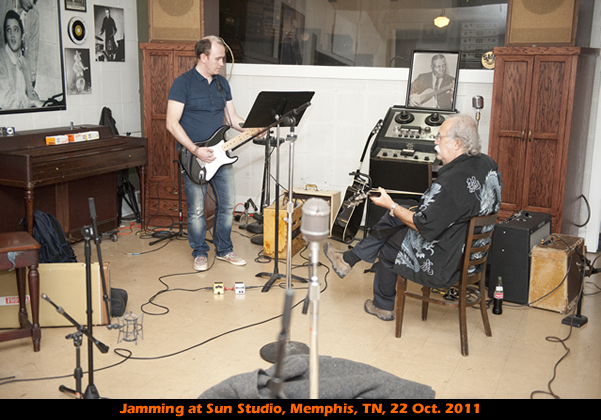 This recording is a hotpot of influences, but the lineage goes right back to Sun Studio in the 1950s. I initially got into music by listening to Nazareth and Whitesnake recordings back in the 1980s, before starting to explore the musical lineage back to Sun and beyond. 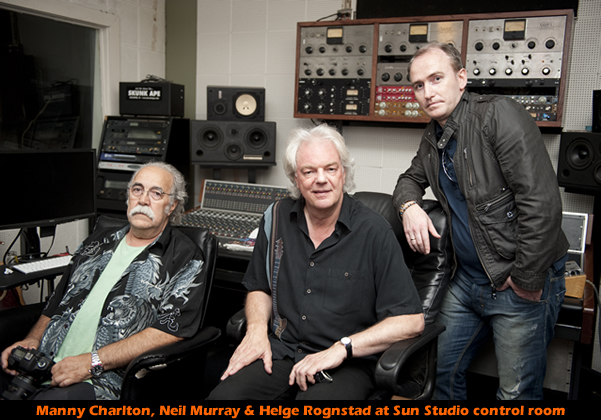 Both Manny and Neil have told me that they first got into music by listening to the music coming out of Sun Studio in the 1950’s. Robert Hall, drummer with Jerry Lee Lewis, is brought up on 1st generation of rock but also influenced by the rather excellent music coming out of Memphis in the 1960’s. We decided to only use vintage 1950s &1960s gear to record these tracks, adding yet another interesting twist to the recordings. 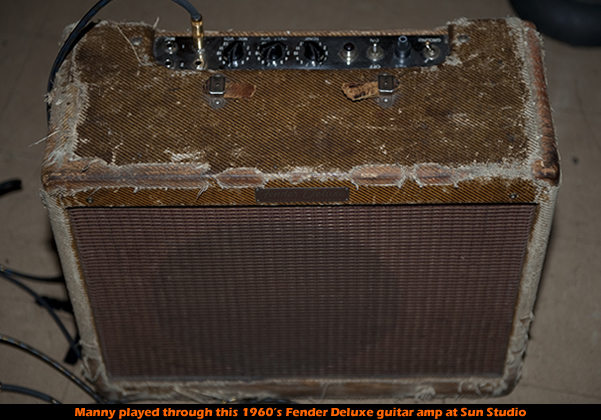 At Sun Studio, Manny used two Gibson guitars, one 295 and a 335 plugged into a 1956 Fender Deluxe 15 Watts Amp, Neil used a Fender Precision bass plugged into an Ampeg B15 Flip Top. Robert used a 1960’s Ludwig drum set. I used a Fender Stratocaster though a 60s Gibson Gibsonette 15 Watts amplifier. (You can best hear this guitar/amp combo on the guitar-intro to “Your Way”). 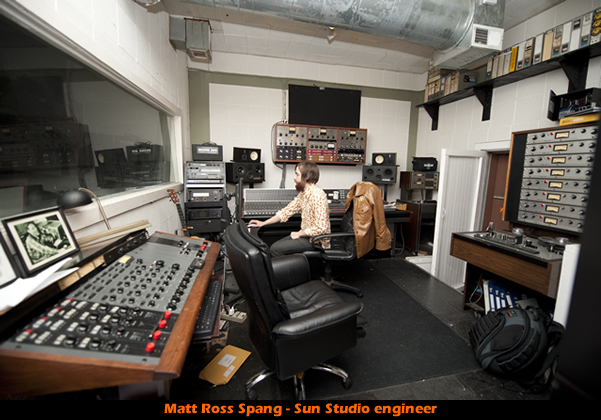 Sound-wise, the acoustic tiles at Sun Studio make for a natural compressor which you can clearly hear when playing inside the studio. Since the instruments are recorded at the same time in the same room, the sound blends into the various microphones which also makes for a special kind of sound. I remember that it was interesting to play back individual tracks during the mixing stage, because you can clearly hear the bass-playing inside the drum tracks and vice versa. Further, the musicians on the album was encouraged to bring in their own feel and ideas to the songs I wrote, so the resulting music is an interesting mix between different sounds, influences and live studio performance. We met up at 1800h at the studio just as the last museum visitors filed out of the studio café. While the engineer Matt Ross Spang prepared for the recording session, we milled around and took a few pictures (you see them on this page). We also got some time to fool around playing some old rock-n-roll guitars. Manny did an impromptu performance of “Mystery Train” on a Scotty Moore Gibson L5 guitar, which had the hairs standing up on my neck. It was also interesting to see how the room was prepared for the recording. Thick blankets were put over the amplifiers, covering both the amp and the microphone in front of it. These blankets would prevent the sound bleeding into other microphones, so that the producer can play around with volumes during mix-down later. After some discussion, we decided to record the old fashioned way, straight off the floor with all the musicians playing together. The idea was to record backing tracks and lead guitar and vocal afterwards. We decided against using click-tracks or mechanical time-keepers – only live drums, which makes the recording sound “off the cuff” and hopefully allow our “natural groove” to shine through. This meant that we had to get the full track recorded in one take. So, if one person made a mistake during the song, we would have to do the whole track again, as it is virtually impossible to cut & paste a whole band coming in from a cut off point. 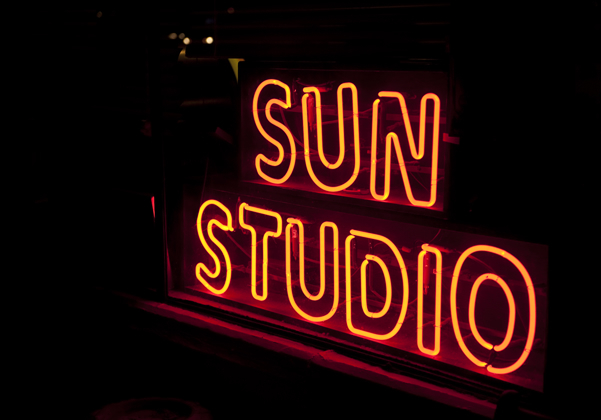 We recorded backing tracks at Sun Studio / consisting of drums, bass, guide vocals and some guitar tracks. The main vocal and most of the guitar overdubs would be done the following week at Madmento Studio in Dallas TX. I think we took between 4-5 takes to record the backing track for “Your Way”, consisting of guide vocals, rythm guitars, bass and drums. It was a bit nerve-wracking at the start, recording at Sun with the best musicians in town. And, on the first take I made an annoying mistake during the second chorus, which meant we had to start again. However, on the second take Neil made a mess of a bass part, which made me feel much better :-). But, by take 5 we all went through without any problems. I was happy to have one song “in the can” - which now was ready to receive guitar and vocal overdubs. The guitar intro (rhythm) which you hear at the start of the song is done by yours truly. This is actually one of the very few guitar tracks recorded at Sun Studio that was not later overdubbed. The following week, at Madmento Studio in Texas, we added all the remaining guitar overdubs. Manny Charlton really did some sizzling guitars on this track: the first guitar overdub was the acoustic rhythm guitar, done on his National Dobro guitar. Next up was a Gibson Les Paul Standard –a 60s re-issue - which you can hear when the song fades out. This solo is done through an Orange amp and a Marshall cabinet. 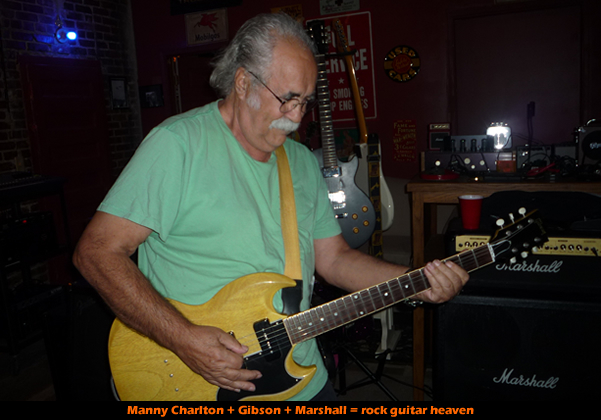 Manny then recorded the fantastic slide solo on his customised green Hofner guitar. This particular instrument has the strings raised high and tuned in open chords, lending itself for slide guitar work. The guitar is also customized by a cut-away to make the top frets more accessible. Manny uses heavy gauge strings on this particular guitar and, interestingly, a mechanical wrench for a slide, making the sound very heavy. I was never really happy with my own voice on this track so my good friend Emil Gammeltoft from the Swedish folk-rock band Some Kind of Rubus would later add his vocals on it. He did a great job. The backing vocals are provided by Georgios Vamvatsicos and Mats Hoxell in Sweden. During the Sun-recording, instead of playing the main riff, Manny played a completely different riff with a tremolo effect. Being radically different to my original rhythm guitar riff, I was not sure how the end result was going to be. But when our engineer Matt Ross Spang played it back for us later, everyone was just amazed how good it sounded. Not only that, but the recording was done in just two takes (!). Genius. 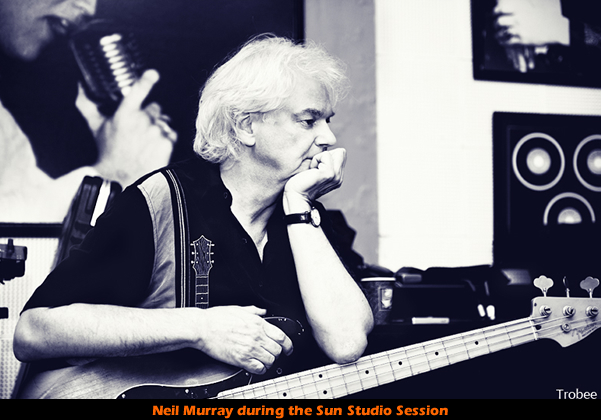 Neil Murray also plays his heart out on this song, it features some really groovy bass lines. During the overdub session At Madmento Studio in Dallas, when we opened the files from Sun Studio, there were 5 vocal tracks which we could select from. I knew I had double-tracked the vocals at Sun Studios, but it was impossible to find out which vocal fitted with which, so we decided to re-record it. I did just one take of the song at Madmento, after which Manny said ”that is the best I have heard you done it” so that is the recording you hear on the album. Manny was not totally happy with the initial guitar recorded at Sun Studio, so he grabbed a Gibson Les Paul and recorded again that eerie tremolo guitar which you hear in the background of this record. The guitar was played through an Orange Amp through a Marshall 4 speaker cabinet using a tremolo effect pedal. And I think he just played this once and it was sounding spot on. The second guitar overdub was to add the main riff which he also used the Gibson Les Paul, but this time with a bit more distortion via Fulltone Primsoul distortion pedal. The song now sounded amazing. The solo was done on a Warmouth Strat which he built himself in cooperation with Bob Laidlaw, a guitar expert in Scotland. This guitar has a completely flat surface and looks just like a piece of cut wood, with two holes at the back for the wiring etc. And it has a Seymour Duncan Pearlygates pick up. This was played right through the Orange Amp without any effects. I must say it was incredibly good fun to sit in the studio and just watching Manny playing the solo on this particular track. All the guitars that you hear on this track are played by Manny Charlton. I am only doing the singing on this track. This is where the problems started. And the problem was that the original & main guitar riff in this track was quite complex and went pretty fast. Added to that, I was the only one who had rehearsed this particular riff, which meant I had to play the riff while singing guide vocal at the same time. Since we HAD to record the whole song in one take… this meant that it was extremely hard to record the guitar and sing at the same time. Starting again, again, again, again. Take 1, Take 2, Take 3 etc.. And when you do that, I can tell you that professional musicians tend to become quickly bored. We must have taken 7-8 takes of the base track before we called a halt to proceedings in order to discuss what to do with our sound engineer. During this break, Manny made me feel much better by telling me how Roger Glover (Deep Purple bassist and Nazareth producer in their early days) had made Nazareth do 42 takes of the 1973 UK no. 3 hit ”Bad Bad Boy” before he was happy with it. –So it was reassuring to know that it is not unusual to do numerous recording takes of a song. –It only becomes a problem when you have limited studio time. Like we had today. So, to speed things up, we decided to record the track without the lead riff. This meant that the guitar riff could be recorded on top as an overdub afterwards. Once this was decided upon, the basic recording was recorded in one take. Phew! In retrospect, as Manny Charlton later would point out, it would arguably have been easier and better to record this particular track with a click track, which means that the overdub rhythm guitar could be easier to cut into the song afterwards without having to worry to adjust riff-speed to a live track. But that was now theoretical discussion, since we now had a live base track which we have to try to fit a complex riff onto. At Madmento Studio the following week, we decided to come up with a new guitar-riff to better suit the song. Both Manny and I jammed this “new” riff on this track using different guitars and amps. Manny also added some really nice harmony guitars using the Warmouth strat plugged into the computer with a Soldano amp effect. Two more guitars were added to the chorus so the song has loads of guitars on it. As on Your Way, Emil Gammeltoft kindly supplied the vocals on this track. I particularly like the chorus vocals supplied by Georgios Vamvatsicos and Torbjörn Walheim (engineered by Mats Hoxell in Sweden). Six Strings was pretty easy to record, and I think we did three takes before we perfected the bass and drums on this one. On Manny’s advice we did some changes to the lyrics and all vocals were subsequently overdubbed at Madmento Studios. The vocals were done in only three takes, and Manny used a mix between those three takes to come up with the finished vocal at the end. Manny Charlton and myself are playing two acoustic guitars on this track, making the acoustic guitars sound almost like a 12-string. The solo consist of two separate guitars creating a harmony effect. Manny played this solo on his Warmouth Stratocaster with Seymour Duncan pearlygates pickup, plugged this straight into the computer with added Soldano amp effect. There is also some nice harmony guitars going on behind the chorus, which I think works well. And the bass on this track from Neil Murray is sublime, as is the drums which cuts out after the solo, only to come in again on the chorus... which was a great idea by Robert Hall & Matt Ross Spang. All photos on this webpage are taken by Mike Trobee http://www.trobestudios.com- and image rights are owned by The Fluffy Jackets. If you use photos from this page, please use the following picture caption “Image(s) courtesy of The Fluffy Jackets www.fluffyjackets.co.uk”. High resolution images (for print-purposes) are available upon request via the press room.